The most eminent architects came here to erect a magnificent city with the best theaters, greenhouses, and taverns. Each architect wants to make the most significant contribution to the city construction, but their ambitions will inevitably lead to a challenging competition. In Architectura, your table turns into a grid of city streets and blocks. Each building you construct affects the value of the adjacent buildings, or even destroys them! Let's say you've just built a magnificent temple. A vulgar market around the corner doesn't belong there anymore and has to be shut down right away — but a park near the temple's entrance will definitely be a good match and will even profit from the divine proximity. 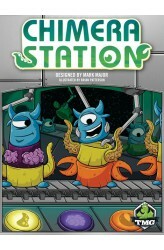 Rotate the cards to change their values, resolve their special effects..
Chimera Station brings a new twist to the worker placement genre: customizable workers. Each worker can be modified in-game by splicing claws, tentacles, leafs or additional brains (or any combination of those) on them. These workers are used to gather resources: points, food, credits, and living parts of aforementioned workers! During the game you'll build and expand the space station and open up tons of different strategical and tactical possibilities. Featuring a grand total of 12 standard action spaces and 40 additional ones (modules), 22 perks, 16 different ways to configure your aliens (via components), and 4 different races, the possibilities are endless! Part I: Gameplay Runthrough https://www.youtube.com/watch?v=UCDiMOiknLk Part II: Final Thought.. It's a big feast in the magical kingdom of Gloutama, where you take on the role of an ever-hungry halfling that goes to the market to gather all sorts of wonderful ingredients from elves, dwarfs, pixies, trolls, orcs and wizards, so you can cook up dishes that will have every creature in the kingdom licking their fingers. 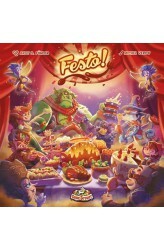 In each of four rounds in Festo!, players try to gather as many ingredients as they can by placing their servants by the different races in the game — but each round consists of two phases in which the players roll three dice that determine whether races are available this turn or not. Some races might be totally unavailable because of this, so players have to decide how many of their servants they want to place during each phase. 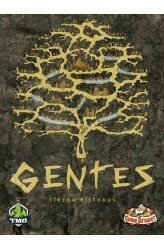 Once this is done, majo..
Gentes is an interesting civilization game with an innovative timing mechanism. "Gentes" is the Latin plural word for greater groups of human beings (e.g., tribes, nations, people; singular: "gens"). 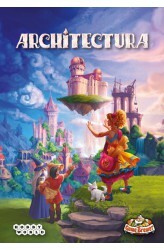 In this game, players take the role of an ancient people who are attempting to develop by building monuments and colonizing or founding new cities in the Mediterranean sea. 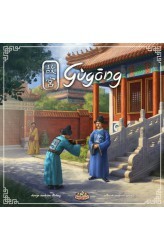 The game is played in six rounds, each consisting of two phases: action phase, and tidying up. There are three eras — rounds 1-2, 3-4, 5-6 — with new monument cards entering the game at the beginning of rounds 1, 3 and 5. Each player has a personal player mat with a time track for action markers and sand timer markers. In the action phase of a round, the players take their turns in clockwise order, conductin..
China, 1570. China is under the reign of the Longqing Emperor, of the Ming Dynasty. He inherited a country in disarray after years of mismanagement and corruption. He resided in the Forbidden city, which was the seat of many emperors under the Ming Dynasty. Constructed from 1406 to 1420, the complex consists of 980 buildings and covers 72 ha (over 180 acres). It is also under the Ming Dynasty that the Great Wall of China was rebuilt, fortified and expanded. Around this period, China was under heavy attack from the Mongols, so maintaining the Great Wall was essential. Most of what we now have left of the Great Wall, we owe it to the Ming dynasty. The country was already famous for its very intricate bureaucracy, but this also led to a lot of corruption. 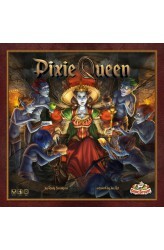 Even though the penalties for ..
Pixie Queen is a smoothly playing worker-placement game about a pixie queen who rules over her subordinates like a true tyrant. The legend tells of pixies being small, flying, naughty creatures often spotted in the area of Cornwall and Devon in the UK. Apart from the stealing, bullying and torturing, they are considered a big nuisance to the human inhabitants of the region. According to the game, they are obliged to do so by their pixie queen... The player with the fewest points wins since the only points one can earn (or avoid) during the game are penalty points. Reward points are given out only at the end of the game, and you can receive rewards by charming the Queen with a golden ring, making additional offerings during the game, or promoting your pixies to faithful servants..